into more than just our gorgeous white sand. Here is a snapshot of just some of the dozens of popular attractions and activities you’re sure to love. Be sure to click on hyperlinks for more info and refer to the map below to see how conveniently close Ocean’s Reach is to everything! Considered the natural showcase of Sanibel Island, “Ding Darling” is a 7,000-acre mangrove sanctuary and home to more than 200 species of birds and wildlife. Visitors can enjoy the refuge by tram, walking, driving, bicycling and several miles of canoe and kayak trails. The Ding Darling Center of Education is the perfect spot to embark upon your journey. Open every day except Friday. 1 Wildlife Drive; 239-472-1100. At the eastern tip of the island stands the Sanibel Lighthouse, Sanibel’s oldest structure (built in 1884) and possibly its most photographed, as well. 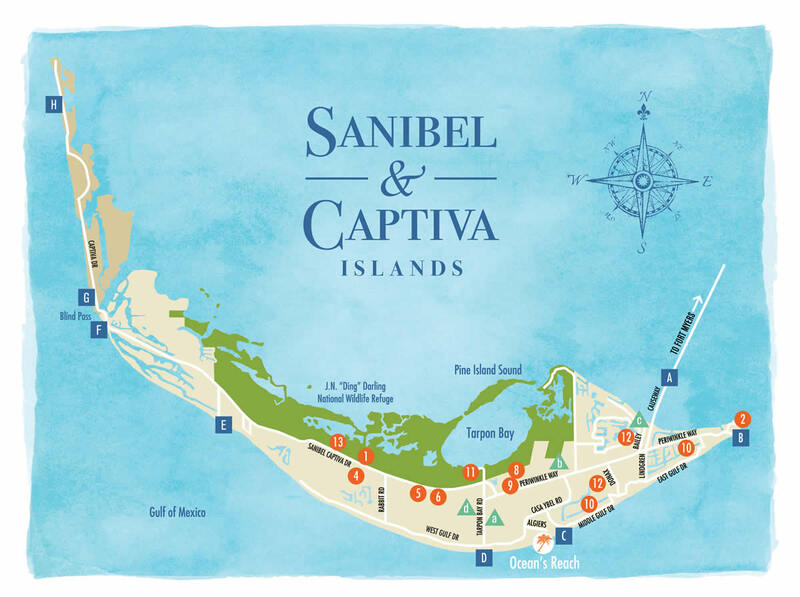 Located in Old Town, a quaint historical area where the island’s first settlers made their homes, the Sanibel Lighthouse is part of a 2.5-mile walking and biking tour created by the Sanibel Historical Society; maps available at the Sanibel Island Chamber of Commerce. Known as a bicyclist’s paradise, Sanibel’s 26 miles of bicycle paths are fun for the whole family. Arrange bike rentals through our on-site Guest Services by calling us at 800-336-6722. We work closely with Billy’s Rentals, and can arrange delivery of rental bikes of all shapes and sizes, including surreys, tandems, recumbent bicycles and trail-a-bikes. Thanks to the Sanibel Bicycle Club and its many supporters, guests can now stop by the “Bicycle Welcome Center” on Periwinkle Way next to Huxter’s Market to learn how to make the most of the bicycle paths that wind their way around the island. Billy’s Rentals: 1470 Periwinkle Way 239-472-5248 and 2437 Periwinkle Way 239-472-8717. The Clinic for the Rehabilitation of Wildlife is dedicated to the rescue and rehabilitation of sick, orphaned and injured wildlife. C.R.O.W. features a complete wildlife hospital and focuses on education in an effort to prevent injuries to animals caused by human interference. Guided presentations are given year-round weekdays at 11 a.m. 3883 Sanibel Captiva Road; 239-472-3644. SCCF offers a unique insight into the island’s ecosystems. 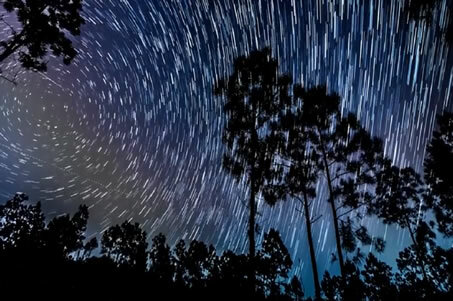 Visitors can walk 4 ½ miles of trails, climb an observation tower, experience a butterfly garden and delight in a Nature Center with various exhibits and a marine-life touch tank. Also featured: a nature shop, bookstore, native plant nursery, guided tours and shoreline discovery walks. Open year round, but hours vary by season. 3333 Sanibel-Captiva Road; 239-472-2329. Named for two pioneer island families, the Bailey-Matthews Shell Museum is the most comprehensive museum in the nation devoted exclusively to shells. Learn about shells from geographical, historical, scientific and artistic perspectives. Open daily, except major holidays. 3075 Sanibel-Captiva Road; 239-395-2233. Island hopping means island shopping! Sanibel and Captiva both offer delightfully unique stores and galleries, guaranteed to let you go home with that one-of-a-kind island find. When you need a little break, head to any of the more than 50 island restaurants for some deliciously inventive fare. Just stop by Guest Services for recommendations! Our island’s cultural centerpiece, BIG ARTS (Barrier Island Group for the Arts) features an extraordinary line-up of performances and educational programs throughout the year. BIG ARTS offers world-renowned music and dance performances; distinguished lectures and speaker series; award-winning films; visual art exhibits, children’s summer camp, and workshops taught by gifted artists and instructors. 900 Dunlop Road; 239-395-0900. Steps from BIG ARTS, our Historical Village offers a glimpse into the lives of the island’s earliest settlers. The Village features a collection of ten late 19th- and early 20th-century buildings: the Sanibel School House (1896), the Burnap Cottage (1898), the Sanibel Packing House (1900), the Rutland House (1913), Shore Haven (1924), the Caretaker’s Cottage (1925), the Morning Glories Cottage (1925), the Post Office (1926), Miss Charlotta’s Tea Room (1926) and the Old Bailey General Store (1927). Open Wed.-Sat. from November 1 to mid-August. Hours vary seasonally. 950 Dunlop Road; 239-472-4648. BIG ARTS also offers live theater in the intimate Herb Strauss Theater, Sanibel’s only professional theater. Enjoy innovative Broadway-caliber dramas, comedies and musicals each season. 2200 Periwinkle Way; 239-472-6862. This little sandy bucket non-profit is dedicated to teaching kids and families about the wonders of ocean discovery through fun experiential “hands on” education. Programs are designed for children aged 6-13; options are also available for adults, teens and families. Half-day sessions are featured through most of the year; a popular weekly kids camp takes place throughout the summer and during holidays. Two locations: Sanibel Flagship at 414 Lagoon Drive 239-472-8585 and Sundial Resort at 1451 Middle Gulf Drive 239-395-7236. Enjoy the tranquil waters of Tarpon Bay in the heart of the J.N. “Ding” Darling Wildlife Refuge. Rentals: kayaks, canoes, pontoon boats, bicycles and fishing equipment. Guided Tours: kayak tours, sunset paddle tours, sea life & nature cruise, breakfast and evening cruises, fishing excursions. 900 Tarpon Bay Road; 239-472-8900. Sanibel offers two 18-hole championship golf courses open to the public, both set among naturally beautiful island backdrops. Both courses are also sanctioned by the Audubon Cooperative Sanctuary Program for Golf Courses, designed to protect the environment and preserve the natural heritage of golf. Sanibel Island Golf Club: 100 Par View Drive; 239-472-2626. 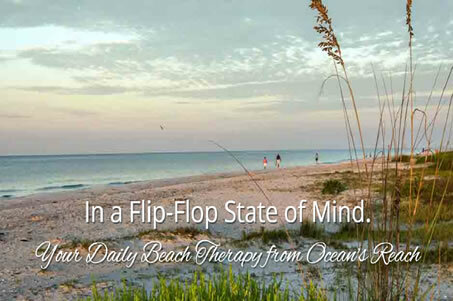 Dunes Golf & Tennis Club: 949 Sand Castle Road; 239-472-3355. Our Rec Center is as beautiful as it is exercise-inducing. Open to the public, the city’s recreation center features treadmills, weight equipment, heated pools, gymnasium, tennis courts, game room and an extensive list of daily indoor and aqua fitness classes. Children’s camp program offered during the summer. Daily and weekly memberships available. 3880 Sanibel-Captiva Road; 239-472-0345. There’s no better way to get a different perspective of the islands – and of life – than out on the water. Enjoy a delightful dolphin cruise, sunset cruise, sport fishing trip, sailing excursion or private charter. Check out “outer islands” that are only accessible by boat, including Cabbage Key, Cayo Costa, North Captiva and Useppa Island. Try out an assortment of water sports, like paddleboarding, parasailing, windsurfing, waverunners and flyboards (don’t worry – lessons are available for all!). Some of our favorite area partners include Adventures in Paradice, Captiva Cruises, Sanibel Thriller, YOLO, Ace Performer and Finnimore’s Paddleboards. Call or stop by Guest Services for more suggestions on how to soak up the islands by taking to the water! At day’s end, slow down and watch the setting sun infuse the sea and sky with wondrous colors. 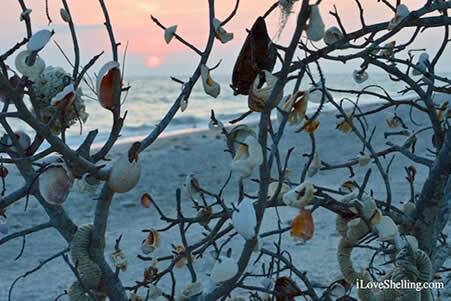 You’ll soon discover that there’s nothing more relaxing than ending a perfect day on Sanibel with a perfect sunset. Oftentimes, visitors will line the beach at sunset – balancing cameras with favorite concoctions – waiting to capture the moment the sun dips below the horizon. For a true treat, stay and watch as breathtaking twilight colors transform the sky into a palette of lavender, coral and gold.